The Art&Soul School MEMBERSHIP KEEPS YOU FILLED WITH JOY AND EASE! Enroll me now for Sapphire! 25 € /mth. Enroll me now for Emerald! 100 € /mth. Looking for Joy and Happiness in your Life by creating from Your Intuition? YOU will learn how to — quieten your mind — balance your life — support your personal and entrepreneurial growth — work from inner listening — solve troubles simplifying a painting — connect your feelings and INNER world to art — resist the temptation to take the painting to the predictable planned direction — ENJOY the pleasurable process — concentrate on CREATION and release self-sabotage — take YOUR artwork serious — let go and get out of your left brain — trust the process more and more with less expectations — turn the critical gaze into JOY — call yourself an ARTIST — grow as an artist — trust that your art is enough beautiful, meaningful and loved — trust that YOU ARE ENOUGH, because YOU simply are enough. Continues automatically after 4 months. YOU can cancel any time after the first 4 months. Refund guarantee first 30 days. [2 months for free!] Full price 300 €. You save 50 €. THIS IS WHERE YOU'LL GROW TO THE NEXT LEVEL, ARTISTICALLY AND SPIRITUALLY.
" I was in a process of new orientation, dealing with my health and looking for what I really want to do. For me very new was painting from my soul and bringing my stories or topics onto paper and see what comes out of it, so deep that I could reflect them more or let them go when they are fixed on paper. " only 5 spaces in full! [2 months for free!] Full price 1200 €. You save 200 €.
" I find more and more calm in me and see that I must completely stand to me in order to really live my life. My creations, whether pottery or my other treasures are suddenly selling. I have arrived in the now these days. " What’s behind — Why am I offering this Membership? For a long time I had this wish to lead a group, but not as you usually understand what a leader does. I wanted to build a community celebrated by our hearts. My greatest wish was to create a ROOM OF LOVE where creative souls might connect and feel safe. Where you might grow together through making art with love and letting go of fear, anxieties or blocks. I found this solution by asking a lot of questions, by inventing, re-creating and by trial and error. I listened to you and they brought me to this concept of the Art&Soul School Membership. I am an introvert and calm person, who needs time for herself like water. However I simply need LOVE and community like air for breathing. In the times where I retreat, I collect all the new energies and wisdom and then share it with the people whom I love. I love to nurture you like mother earth does and I want to see you shine your light like fire. Creation is a big part of this journey. As I am a painter I chose painting for this journey and because painting gives a direct source to work from the heart with the vibrations of colours. As my Art&Soul School member YOU will get nurtured on a soul basis and YOU will be filled with JOY and EASE. I hold the space for YOU to find your peace and your fulfillment too.
" Before I joined the Art&Soul School I was desperate about the fact that I work in a field and with a company (a portal for spiritual consulting) who degraded us coaches from free entrepreneurs to subcontractors. I was on the search for ways to become a life coach without the spiritual aspects because I felt not well to be one of those people who talk about spirituality and act regardless to any spiritual value. But on the other hand I am a spiritual being and knew that I should not repudiate my natural senses and inner wisdom. Another problem was that I did not find a way to connect my "bread and butter job" as a coach with my artistic gifts and needs. After a severe writing blockade which softly started to fade away I had realized that painting, dancing and music did not take place in my world any more. I sat in my room, waiting for clients' calls, feeling existential fears and, while looking out of my window I asked myself why I feel like a prisoner. Just a few months in the Art&Soul School I feel much more lightness and freedom. Definitely, a healing process has started and a lot has changed in my daily life. I always follow the call to paint if I "hear" it. I have become more confident to see and to describe myself as an artist. And - I am not afraid of being a spiritual being and a serious coach as well and I know I need not hide one or the other, to stand up and be counted as intellectual, spiritual and artistic being as well. " WHAT IS THE CREATIVE AND SPIRITUAL MEMBERSHIP? The Art&Soul School membership is an incredibly inspiring, content-packed online program designed to nourish your creative soul and to keep you showing up for your own creative process. Each Month focuses on a distinct theme, and includes channeled meditations, a healing prompt, a painting prompt and lots of bonuses as live-calls, real-time painting sessions, inspiring creative/healing exercises, valuable creative resources and links, written content and much more. The first month of the membership will be January 2019. You will get instant access to the membership group on Facebook and on my website’s member-zone. HOW DO I ACCESS THE MEMBERSHIP? The Member-zone is a private Facebook group, which you will be added to immediately after your enrollment. You will also receive a personal login to the password protected member-zone on my website where you can find all the content in one place. As long as you are a member all the content is accessible to you. WHAT IS THE BENeFIT OF A MEMBERSHIP COMPARED TO A COURSE? In a membership you are part of a thriving art & soul community and you can use all the content that has ever been released. There is time to observe, time to relax, time to inhale, time to exhale, time to connect and time to grow. 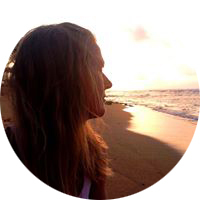 While in a course you follow a strict plan to walk through, a membership is intended to offer more space for your individual process, I offer ongoing support as you dive even deeper into different aspects of your healing process. HOW MUCH DOES THE CREATIVE & SPIRITUAL MEMBERSHIP COST? I offer two membership types. You can there choose between monthly or annual payment. Annual payment offers 2 months for free. 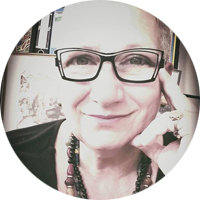 The Sapphire Membership is a basic solution for you, if you have a limited time and though want to heal deeply and improve your art practice. Monthly costs are 25 €. Annual are 250 €. 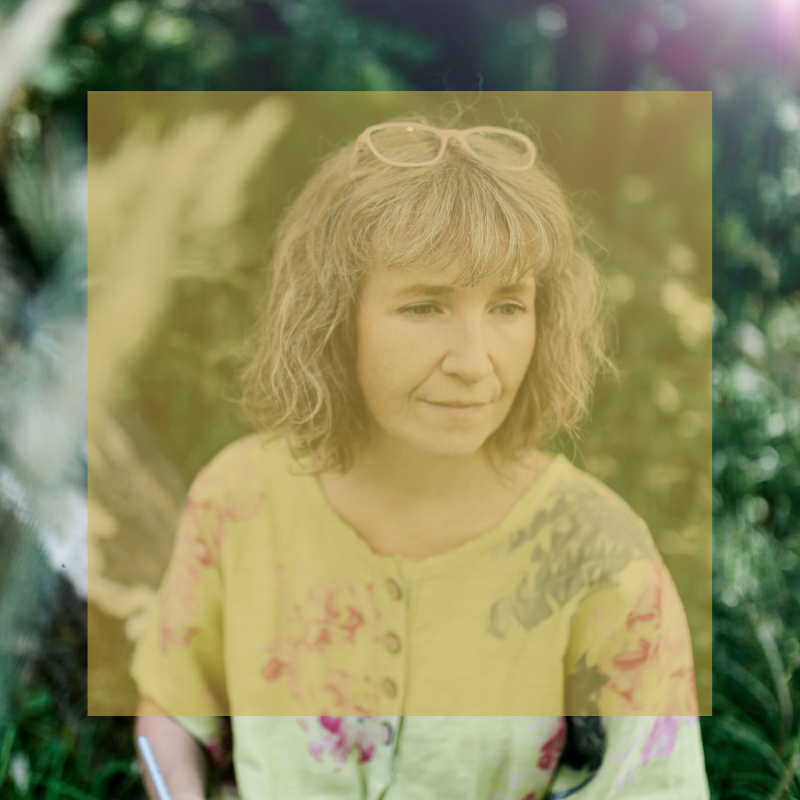 The Emerald Membership is for Souls who want to dive deeper, take your artistic and spiritual practice to the next level, witness yourself in a more intimate space and be a constant part of the whole healing process. You get a lot of private time with me with choosing this option. Monthly costs are 100 €. Annual costs are 1000 €. I HAVEN'T PAINTED BEFORE, IS THE CREATIVE AND SPIRITUAL MEMBERSHIP FOR ME? Yes! The Creative and spiritual membership is appropriate for all levels of creative experience. Each month is designed to inspire and support you on your creative path while honoring body, mind and spirit. Often it can also be an advantage to freely dive into all its beautiful depth real deep. I AM ALREADY A PROFESSIONAL ARTIST, IS THE CREATIVE AND SPIRITUAL MEMBERSHIP FOR ME? Yes! Even if you have been painting for years, this membership will offer fresh perspectives, new inspiration from deep inside and a connection to an online community of kindred creatives. I HAVE NEVER PARTICIPATED IN AN ONLINE LEARNING PROGRAM BEFORE. HOW DOES IT WORK? You get access to the private member-zone group on Facebook instantly after you have enrolled. You also get a password-protected account for a member-zone on my website, where you'll find all the files in one place. Every month you will be given inspirations, a meditation, a painting prompt, healing vibes, on point information and certain exercises you can easily integrate into your life, love and compassion by connecting in the private Facebook group. 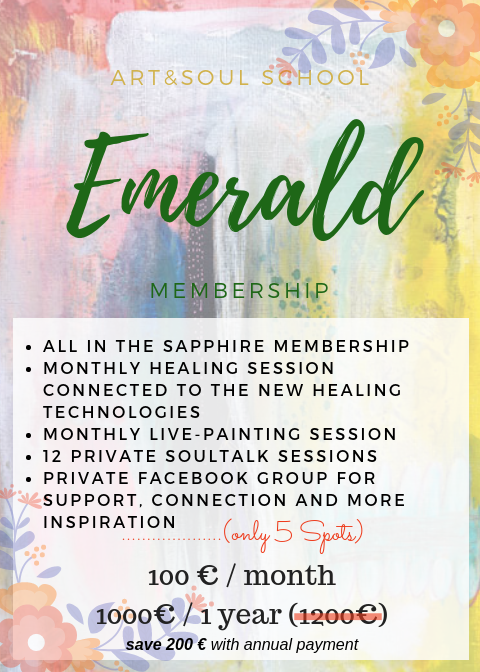 In the Emerald membership you'll get a monthly live-painting and a monthly healing session in addition to the basic membership content. Painting will help the healing process. We paint from our intuition after listening to a meditation which I channel for you each month. I have build a specific geometric energetic form which functions like a source/collector of healing/inspiring energy for the members. You can envision it like an elongated double pyramid where all the wisdom is stored and free to take. This geometric has been filled since march 2018 as I started out with a small group of old souls to prepare the base. This is a new technology which will become more inherent here on earth during the next years. In simple words the membership is your holy place in the woods where you meet the fairies and where you are totally connected to divine reality. So we created our sacred space, a dwell to re-fresh and be nurtured through the time you are here. All content is downloadable and yours to keep. It is for your personal use only. You receive weekly inspirations easy to integrate into your daily schedule. Every first of the month you will get your monthly meditation and the painting prompt. You can adapt after and work through the additional material at your own pace. Each month will provide a different theme accordingly to the earth and group energy, in addition you will be provided written and audio content. All in all I have an eye on not overwhelming you with content in length. It will be content in depth. Live-painting sessions and healing sessions are once a month for the Emerald Membership attendees. IS THE LANGUAGE IN THE GROUP ENGLISH? Yes, there are native English speakers and souls from all over the world with English speaking skills in the group. The language of the live sessions is English and the curriculum is written in English too. The idea behind this choice is to unite the world and to give possibility to souls, who want to emphasize their English skills. You will benefit from your native English speaking friends in the group. Don't be shy. It is time to take a step out of the comfort-zone and the first step into a new freedom. I will help with any comprehension problem and you can talk to me in German however. I just want to be clear the primary language is English. I want to encourage you to trust your soul that you can. WHAT IS THE ONLINE COMMUNITY YOU SPEAK OF? 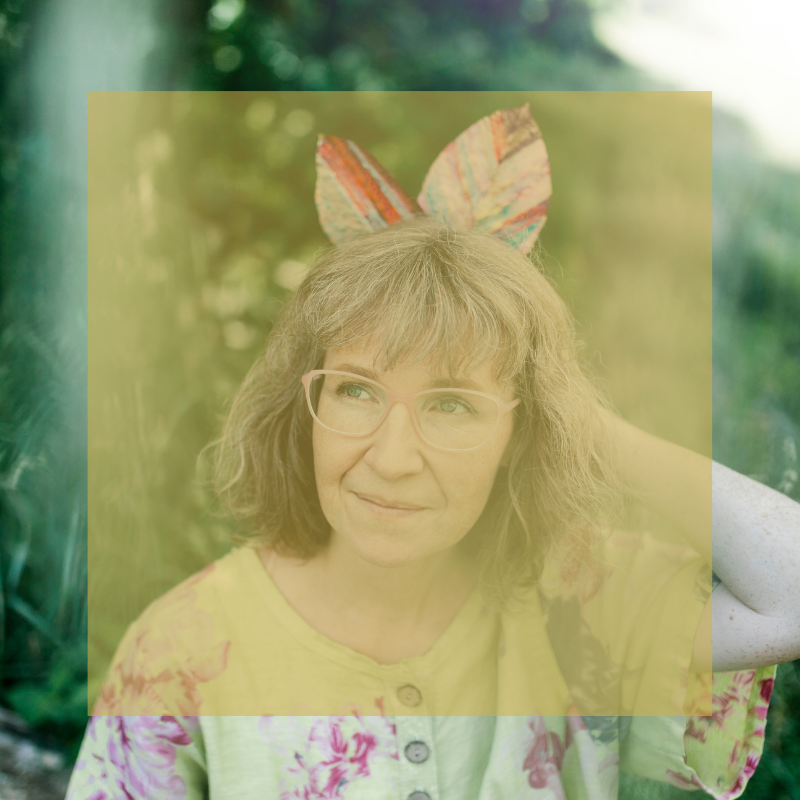 As a participating member of the Creative and Spiritual membership, you will be invited to join a private Facebook group to connect with other creative souls worldwide. This is a great place to share your process, ask questions and generally connect deeply with other creative souls in a loving circle. WHAT IS THE FORMAT FOR THE CREATIVE SESSIONS? The painting prompt (pdf) and the meditation (mp3) come together via Email and are posted on the website and in the FB-group. You get all the inspirational prompts in the group and extra via Email. The live-painting session (Emerald membership only) is live and brought to you via Zoom. It is easy to access and we are able to see each other on the screen and have the possibility to communicate. The healing session (Emerald membership only) is a distant healing session on a certain date and time. We primarily use A3 watercolor paper and acrylic paint. Canvas and additional supplies are optional, as well as paper-cut-outs, paint pens, pencils, crayons, stencils, inks, spray paint, oil pastels, etc. You will get your supply-list with your welcome Email. WHAT/HOW IS THE LEARNING/HEALING PROCESS? The goal is to get connected to your inner voice and to get a feeling how to put it out to the world. How to ground and how to live with the awareness of your spiritual gift and not to be separated from reality on earth. I will guide you how to trust your intuition and how to find joy in simple things and how it is connected to your soul. The creative sessions in the group are such a delight. Each one of us is creating her own expression and at the same time we are exploring together and learning from each other, healing together. They are about an hour live / 15 min recorded. Then you get some following tips how to go further on your painting on your own. The course is not primarily about to learn how to paint, this will be a second step. It is about to learn to set free your creative power and to get into a place of total trust and well-being to follow your intuition on it. It totally is up to you which medium you want to emphasize and any idea on materials is welcome. It may have an creative impact on the group if you bring your own ideas. But equally you will get a golden thread to follow by me as your instructor. WHAT IF YOU HAVE QUESTIONS FOR VERENA? Each month I do a live Q&A (as a bonus) for the members and as you submit your questions in advance I will go through all of them in the live-call and you can ask your questions live also. If you cannot attend a live-call, no worries. All will be recorded to watch later. WHAT WILL I NEED TO PARTICIPATE IN THE CREATIVE AND SPIRITUAL MEMBERSHIP? You will need to enroll in a membership of your choice, have a high-speed Internet connection and a few basic art supplies to participate. Each month will be different and will require different materials, but a basic set of acrylic paint, foam brushes, bristle brushes, paper or canvas, a spray bottle, rags, markers, a journal and an open mind is all you will need. You will get additional info on that with your welcome Email. WHAT PAYMENTS DO YOU OFFER? If you book from my website and pay in full it is 1000 Euros (convert here) using PayPal or credit card. This is the best way to save money. Then you have the second option on request of two payments à 550 Euros (in full 1100 €, convert here, you still save 100 € compared to the monthly subscription). The second payment is one month after the first. You will get an invitation to make your second payment. Two time payment plans are not installed right now and are only available for a year-long membership. You will have to email me. I hope that helps. It is built on mutual trust. If you book from my website and pay in full it is 250 Euros (convert here) using PayPal or credit card. This is the best way to save money. Then you have the second option on request of two payments à 140 Euros (in full 280 €, convert here, you still save 20 € compared to the monthly subscription). The second payment is one month after the first. You will get an invitation to make your second payment. Two time payment plans are not installed right now and are only available for a year-long membership. You will have to email me. If you book from my website you will be charged 100 € monthly (convert here) using PayPal or credit card. Although you will have to commit for the first 4 months, you will be charged monthly. If you book from my website you will be charged 25 € monthly (convert here) using PayPal or credit card. which artistic transformations have You been experiencing since joining the Art&Soul School? Painting. I transformed in bringing colours and patterns out of my deepest self. Before I didn’t know what and how to do, now I turn it over and just do. While my old paintings are more or less dark and sometimes of a depressed mood or showing some of my nightmares the colours I use now are getting much more light. I did let go my prejudice that light colours might be not "serious". Feeling more free. Taking my time. Starting to see more around me. And including it. More fantasy like. That painting shows me much more than I thought, that it could be a part of me but that I can experiment with color etc, everything is ok.
You get my 10 days full money back guarantee if you should think the membership is not for you after all. In case you cancel the membership before the 10th of the first membership-month, I will just quickly send you a little questionnaire to answer and send them back within the refund period. My goal is to serve you the best I can. We are going into relaxation, release and exhaling all fear and anxieties. You are aware that the group energy will multiply the healing process. In a group the energies are cross-linked together and the healing process is partitioned between the attendees. This is very amazing and so much more healing will take place in shorter time as if you were working alone on only your present issues. You will be healing issues you are not even aware of, because an other person in the course is going to solve them. Amazing, amazing, amazing. What I do is to energetically build a geometric room-structure whereto your soul is connected during the time of the membership. It is an Octahedron, a double pyramid. This structure is unbound from time and space. It is a pure energetic structure over-watched by a group of the highest lights in the universe. You will get all the healing information and energies from there. I have gone through it all. I have done all my work (never-ending by the way) myself and am totally aware of who I am. This is my Superpower. To know who I am. Absolutely there are facets of myself, which I will integrate step by step, but the essence has been opened to me during my work and made it possible to let go the old conformations of previous-lives-promises. I dedicated to my decisions and took my soul by my hands to live this wonderful life now. I am at peace. I am at home in myself. Something I want for everyone to experience. I am emphatic and true. I love to get to know my clients. I love it the family's way. I believe in MYSTERY and MAGIC. I have had the pleasure to acknowledge them. Now they are my best companions. I know that everyone is divine and full of strength and wonders to be opened now. Time is up. Time is now.